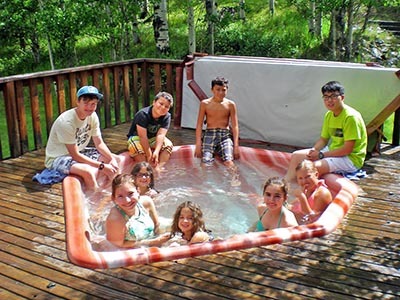 The Red Creek Lodge Hot Tub is only open to guests staying at our Red Creek Lodge. From the back deck of the lodge one can take in a scenic view while relaxing in the warmth of luxury. The Hot Tub opens at 9:00 a.m. and closes at 10:00 p.m. and is a “free-time” activity.